We may not be getting any straight-up Harry Potter movies anytime soon, but Warner Bros. is prepared to keep us in the wizarding world for quite some time. It was announced today that the Fantastic Beasts spinoff series will consist of five movies. It is very clear that Warner Bros. has a lot of confidence in the franchise and that they want to capitalize on the Harry Potter association as much as possible. During a fan event for the upcoming Fantastic Beasts and Where to Find Them, Harry Potter creator J. K. Rowling announced that there are plans for a total of five movies in the series. This was very quickly confirmed by Fantastic Beasts' Twitter account. Here is what J. K. Rowling had to say about it. "I'm pretty sure that there are going to be five movies, now that I've been able to properly plot them out. We always knew that there would be more than one." A couple of months ago, Warner Bros. officially announced that Fantastic Beasts and Where to Find Them 2 would be coming out in November of 2018, long before the first movie's release. David Yates, who directed the last four Harry Potter movies as well as Fantastic Beast and Where to Find Them will be returning to direct the sequel. 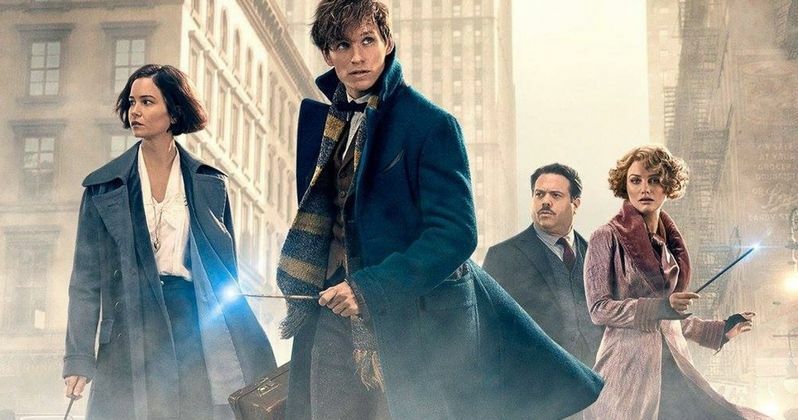 Initially, it was thought that the series would be a trilogy, but it seems that J. K. Rowling was able to come up with a bit more of a sprawling and ambitious story that justifies a couple more movies. Attendees at the global Fantastic Beasts fan event were not only treated to the announcement from J. K. Rowling, but they also go to see the first ten minutes of Fantastic Beasts and Where to Find Them. Early buzz on the movie has been highly positive, and word from those in attendance has been exceedingly positive as well. J. K. Rowling is making her screenwriting debut with Fantastic Beasts and she is also writing the script for the sequel. Given her commitment to the wizarding world she has created, it isn't hard to imagine she will stay on to write the scripts for all of the movies, assuming things continue to go well. Recently, a play that continues the main Harry Potter storyline, Harry Potter and the Cursed Child, opened in London. Fans (and likely Warner Bros.) were hoping that perhaps the play would get a movie adaptation, but J. K. Rowling has made it very clear that won't be the case. So, the news that Fantastic Beasts and Where to Find Them will be a massive, five-movie franchise is likely a pretty solid consolation prize. Fantastic Beasts and Where to Find Them takes place in New York in 1926 and follows Newt Scamander (Eddie Redmayne) as he tries to round up a bunch of magical creatures who manage to get loose in the city. In addition to Oscar winner Eddie Redmayne, the cast also includes Katherine Waterston, Dan Fogler, Alison Sudol, Ezra Miller, Samantha Morton, Jon Voight, Ron Perlman, Carmen Ejogo, Jenn Murray, Faith Wood-Blagrove and Colin Farrell. Fantastic Beasts and Where to Find Them opens in theaters on November 18.